Leading Pop artist James Rosenquist—who came to prominence among New York School figures like Roy Lichtenstein, Jasper Johns, Robert Rauschenberg, and Willem de Kooning—is well known for his large-scale, fragmented works that bring the visual language of commercial painting onto canvas (notably, from 1957-60, Rosenquist earned his living as a billboard painter). 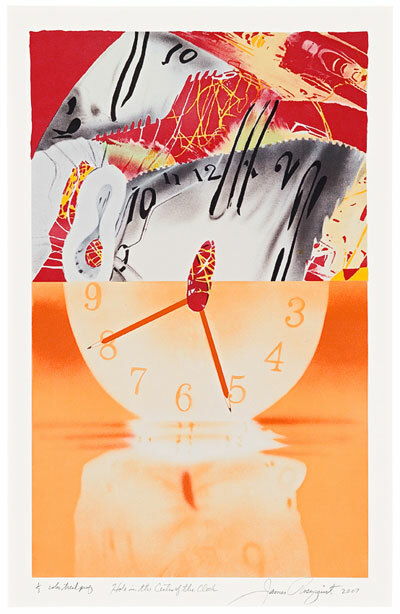 In his use of mass-produced goods and vernacular culture rendered in an anonymous style, Rosenquist's work recalls that of Andy Warhol, while his seemingly irrational, mysterious pictorial combinations owe a debt to Surrealism. His breakthrough work, the iconic F-111 (1965)—51 panels that total over 22 by 24 feet—juxtaposes an American fighter plane with a Firestone tire, garish orange tinned spaghetti, and a young girl under a hair dryer.